I’ve been going on for months about how I’m ready to ditch Daredevil. The book has become decreasingly interesting to me, following an inverse relationship with my sense that Brubaker has been dragging out the formula of “A Daredevil villain wants to get at Matt Murdock by way of his personal life, which is continuing to unravel, and that is manifesting itself through an increasingly violent and unstable Daredevil.” I’m glad that events that took place in the first arc of Daredevil Vol 2 are still resonant, but that resonance was becoming a drone. I was only picking up two other books last week, so I decided to take a chance on Daredevil #111, part 1 of the Lady Bullseye arc. Not only did Daredevil have everything I said in the opening paragraph going against it, but the lead villain is a female knock-off of Daredevil’s arch-nemesis, which seems more appropriate for a dwindling and desperate 1990s reinvention attempt (I’m thinking Lady Octopus). But Bullseye is a good guy now, so if you want someone to kill people by throwing things quickly, what are you gonna do? 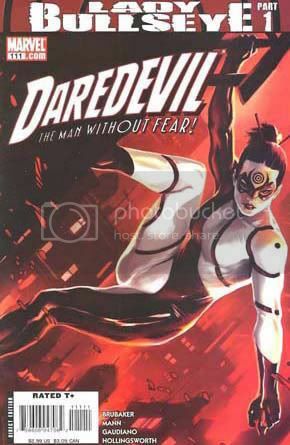 So in this particular issue, we don’t see much from Lady Bullseye, but what we do see counts: 1) her “origin” stems from admiration for the original Bullseye as he tore through her Yakuza captors; 2) she’s pretty ruthless and digs the carnage; and 3) she’s on a mission for the Hand that actually doesn’t include targeting Daredevil. So right off the bat, we don’t have a villain going after Matt Murdock. Hooray! A quick scan of the Comics Industry for Obama member names shows folks like Jimmy Palmiotti, Steve Niles, Michael Allred and Mike Mignola, as well as Doomkopf friend Aaron “Geek in the City” Duran. The facebook lineup includes some additional big names like Howard Mackie, Len Wein and Jim Valentino. 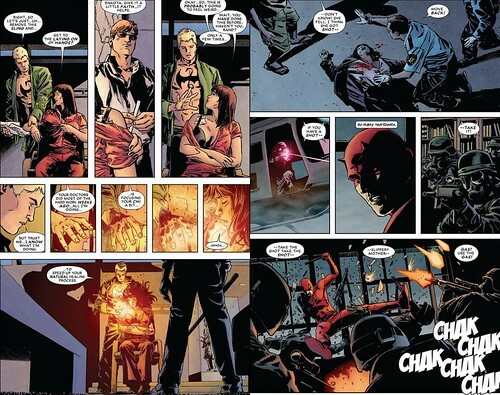 One is from Daredevil #110, with pencils by Michael Lark. 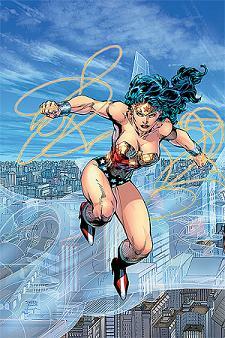 The other is from #111, with pencils by Clay Mann. Can you tell the difference? Probably not, and I think that has a whole lot to do with the talent of inker Stefano Gaudiano. Inkers don’t usually get a lot of credit these days, but I guess that’s really the nature of the job. There’s really only two circumstances in which you’d notice their work: if they’re just really bad at it, or if they overshadow the penciller. Jerry Ordway is guilty of the latter a lot, specifically in the Trinity back-ups when he inks Mike Norton’s work. It looks like Jerry Ordway’s art, not Mike Norton’s. Gaudiano’s guilty of overshadowing his artists too, but I don’t think anyone realizes it. I’d be willing to bet that the vast majority of DD readers didn’t even notice there was a different penciller this issue. Gaudiano’s inking brings a nice consistency to the art on Daredevil. That’s the sign of a great inker. I can’t stand Brian Michael Bendis. But I love the Avengers. See the problem here? It’s been four years since Bendis disassembled the Avengers, I haven’t been able to enjoy an Avengers title since. Okay, Young Avengers and The Initiave have been good, but I’m talking classic Avengers. And it doesn’t hurt that I’m a fan of Slott, of course. Is it too much to hope that he might stick She-Hulk on the team? Let’s see. Marvel published seven comids that I bought this week. DC published…Trinity. Sort of a disappointing showing this week from the DC Nation. Of course, none of the Secret Invasion tie-ins I got this week (She-Hulk, Thunderbolts and Avengers: The Initiative) were very good. And X-Men: The Legacy wasn’t anything to blog about. Neither was Fantastic Four, for that matter. So I guess it was really just Daredevil and Runaways versus Trinity. But Trinity kind of sucked anyway. In fact, Image may have put up a better showing (with PvP) than DC did this week. You know, I have never seen Nova in finer form. I mean, this comic really displayed the writer’s ability to form complex sentences and use spell check. This fused with that menacing posturing that the penciler was able to dream up (I mean, slightly squatting with fists clenched? What an innovator!) along with, and I know I am going out on a limb here, but excellent use of power beams on the inside of the comic made for maybe one of the best comics that I didn’t read this week. This is the best spin-off of the season. This is the Hulk’s love-child from an extra-planetary romance that he had whilst on vacation from being angry all the time. This was a really interesting allegory for the problems that we all face in our everyday lives. I mean, who of us can’t understand what it’s like to get goo on your favorite baseball bat and then destroy a planet? I give this six illiterate comic book reviewer thumbs up! Mr. Mxyzptlk gets pissed and realizes in a fit of boredom that everyone would find Superman a lot more interesting if he would have to deal with the really hard-hitting issues like leash-laws and how to avoid getting neutered. He was wrong and this comic has a silly cover. In the lead: Morgaine Le Fey, Enigma and Despero cast the spell to retcon Superman, Batman and Wonder Woman out of existence. And Krona hatches from his cosmic egg. In the back-up: Konvikt (remember him?) escapes from custody, and decides to head back to Thayer’s Notch to make amends for the one guy out of four he killed that wasn’t in the military. But then he just ends up sitting on the top of a mountain while a giant tidal wave overtakes him. In the other back-up: The bad Trinity is engulfed in a golden glow. The good Trinity is trapped in total darkness. The world has been reshaped as if the Trinity never existed. And Lois Lane’s a smoker now! My take: According to the DC Nation page at the back of the book, Trinity the series has come to the end of its first arc. According to their math, 16 1/3 issues is a third of the series. That means there’s going to be 49 issues of the series, which just seems like a weird number. Not quite 50, not a multiple of three…seems more likely that they just screwed up the math. As a big fan of alternate universes (the Age of Apocalypse got me started on comics, and it remains one of my favorites), I’m looking forward to the World Without a Trinity arc. The WWaT is featured on the series’ covers through issue 24, but I’m not really sure they’re going to spend a whole seven issues on it. It would be kind of cool if during this period the WWaT story is the lead and the Trinity trying to escape the spell was the back-up. But I really have no clue how any of this is going to play out. 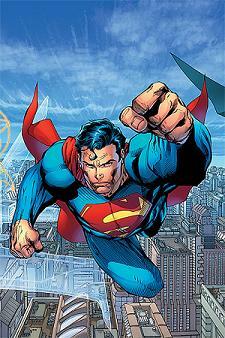 I do love the [comic book movie] genre, I just wanna make sure that I’m able to express who I am. I don’t want to get so lost in the subject that I have to neuter everything that’s me in it, so maybe ‘Unbreakable’ is the comic book thing I should do — I keep coming back to that. It’s Tuesday. It’s Doomino Effect time. 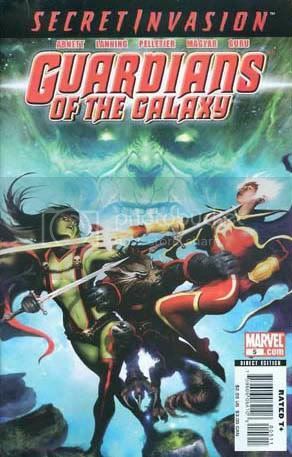 Starting off this week is Guardians of the Galaxy #5, one of my favorite series in existence. I moaned last month about Secret Invasion crossing over into GotG, even though the series is so new. Well, the genius known only as “Dan Abnett and Andy Lanning” is managing to make this crossover fit seamlessly into what was already going on, so I don’t mind it as much. I just really hate when the big events cross over into books I’m reading and it makes an abrupt change simply for the sake of crossing over, like when World War Hulk made me hate Ghost Rider for two months. But this Skrull business fits right in with a new team in a new setting getting to know each other and the mess they’ve decided to become a part of. Bravo to the creative team for that. And I raved about it last month, but the art on this book is fantastic. Paul Pelletier and Rick Magyar pull off an attractive blend of realistic proportions and expressive emotions. And there was something about that first panel on page 4, where Drax is in mid-drop from the ceiling, that struck me as an amazing depiction of bodies in motion. I was reading this and remember thinking “Man … that’s a still drawing, but I can just totally feel the movement in it.” It may just sound like I have a crush on page 4 panel 1, but I do. 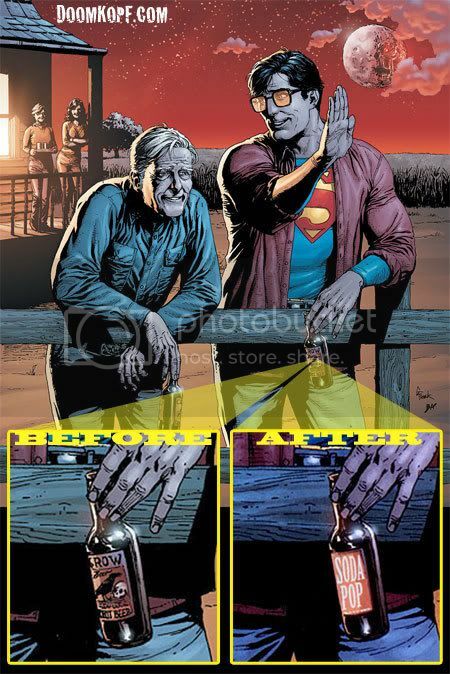 Rich Johnston reported a week ago that DC had recalled Action Comics #869 due to what was apparently an unacceptable depiction of Clark and Jonathan Kent drinking beers while leaning up against a fence down home on the farm. 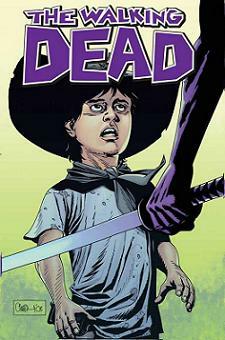 If you couldn’t tell by the cover, this issue features the return of Michonne, samurai sword in hand. But happily, that’s not the only return this issue. Rick and Carl have been on their own for several issues now, and while the stories have been very good (especially last issue’s mysterious phone call), there’s not a whole lot you can do with two people in a house during a zombie apocalypse that hasn’t been done a million times before. So this issue, Rick and Carl hit the road and try to find Herschel’s farm. Along the way they run into some zombies (literally) and Michonne (not literally). And while Rick can’t quite find Herschel’s farm, the next best thing happens: Glenn and Maggie find him. Glenn and Maggie are back, and they’re riding horses, which means they’re probably living at the farm. Which means Andrea and the old guy with the fishing hat and the twins and the little girl are probably living at the farm too. Man, it’s been almost a year since we last saw these characters, and I can’t even remember half of their names, but I’m glad as hell to see them all again. Hopefully those new folks with guns on next issue’s cover are just as nice. I like the idea of a team roster that isn’t the same every issue. If you’ve got all these mutants living in the same place, why would you always go back to the same 6 or 7 guys when you have dozens of mutants with dozens of different powers at your disposal? Like for instance, Archangel would be good for recon in a wide open space, but he’s not exactly the type of guy you’d bring into close quarters combat. If you need a teleporter, there are now two you can choose from (and thankfully, they both have pointy ears). And since the other main X-Men book (X-Men: The Legacy) only stars Professor X and Gambit, there’s a hell of a lot of mutants at Cyclops’ disposal now. In the lead: Superman, Batman and Wonder Woman take the fight to Morgaine Le Fey, Enigma and Despero, and are working better as a team than ever thanks to Le Fey’s merging spell. During the battle, Superman and Wonder Woman realize Enigma is the Antimatter Earth’s Riddler, and Batman notices that Despero isnt really Despero, but not before “Despero” can brand Batman with the final tarot symbol. While on monitor duty, Firestorm discovers that Krona’s Cosmics Egg is missing. In the back-up: Hawkman and Gangbuster rescue Tarot. Hawkman turns back to help the Trinity and gets blown up, presumably as a result of Morgaine Le Fey casting her spell. My take: Not a whole lot of excitement this week. We all knew this was going to end with Batman getting marked so the bad guys could do their magic and make Ragman the new guardian of Gotham. 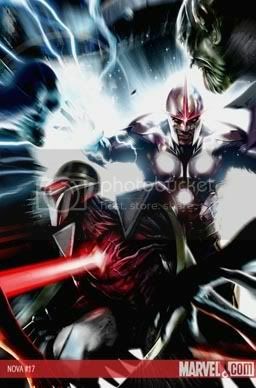 The fight was kind of cool, with the heroes constantly changing opponents to keep them off guard. Certainly nothing to write home about, though (or apparently write a blog about). I really don’t care about Tarot anymore. Come to think of it, I don’t think I’ve ever liked Tarot. She’s obviously just there to serve a purpose in the story, and Busiek doesn’t seem to be doing a lot to make her unique. I had actually forgotten that Tarot was still being held captive when Gangbuster rescued her this week. I’m guessing she still has more of a role to play, so I hope her character becomes a little more interesting than a plot device. Things to keep an eye on: Superman immediately wonders why the Antimatter Riddler isn’t a good guy when he realizes Enigma’s true identity. I guess I assumed that since our Riddler is now a good guy, the Antimatter Riddler would be a bad guy. But now it looks like there’s more to that story. So if Despero isn’t Despero, than who is he? Immediately I thought of Lex Luthor, but how could he have possibly known Le Fey and Enigma would seek him out? The story is pointing towards Krona being behind everything, so is he just influencing events to facilitate his rebirth? Does that mean “Despero” is working for Krona?